If this property is booked, email me anyway, I have other oceanfront homes or condos that may be available for your dates! Enjoy the fabulous surf and sounds of the ocean before you, as you sip your morning coffee or evening wine or Margaritas. Enjoy the fresh ocean air in peace and tranquility. Dine on your private 180 degree ocean view deck, or enjoy a quiet dinner in the diningroom. 'Wow!' is what new guests say as they enter the livingroom and experience the wide open ocean view before them. The livingroom offers a huge inviting fireplace, to view & savor the sounds and sights before you; the waves, surfers, dolphins, cruise ships,fishing boats and all of the marine life as it flows before your eyes. Take long relaxing barefoot walks on the beach, or take a short stroll/jog to the local boutiques or restaurants. Boogie board, surf or just read a book as you relax and sunbathe! Hike in Torrey Pines or why not take in a round of Golf at one the World Class Golf Resorts? Spend a day at Disneyland, it is only a little over an hour's drive away. Or take the kids to Legoland, only 10 minutes from the beach house. Take a short trip to San Diego and enjoy the World Famous San Diego Zoo. How about the Wild Animal Park for a picnic? When the weather is cool, sit in front of your huge crackling fireplace while listening and watching the crashing surf before you! You will never get a better night's rest when you let the sound of waves and scent of the ocean lull you into a most relaxing night of sleep. I fell in love with North Coast San Diego, especially between Del Mar, Carlsbad, Oceanside. I originally moved to San Diego from Orange County, CA when I worked in the hotel industry. Eventually, I started booking not only my property, but others and the business took off, started in the year 2000! We originally bought this property as an investment and rented it out long term, but found that the vacation rental business was better and easier to care for the property as well as to have use of it ourselves. This location is incredible, so central to San Diego and Orange County- and an easy drive to Los Angeles when the occasion is required. You can get to so many places in a reasonable amount of time from the north coast of San Diego. This house has a really great floorplan with 50 linear feet over the oceanfront! It is so relaxing to be able to kick your shoes off, pour yourself a glass of wine or fresh ice tea, make yourself lunch, and and watch everything happening from the convenience of your patio. No need to go out to brunch over the waves, you are there! Safe and secure, very private, and anywhere you want to go, it is probably found within 2 minutes to an hour. We take our 'child' Tiki (the maltese), for walks along the one way neighborhood street of Neptune into Encinitas, or just a block over to Coast Highway for dining at the local restaurants. Or, we might just have our dinner oceanfront with the gentle breezes! The dining table and slate patio table are large for family and guests, and if it is cool outside, we 'dine in' watching and listening to the waves! A huge fireplace for cozy nights too! We love it, and so do all of our many guests. For those who like to cook, the kitchen has everything, stainless appliances, a double electric oven, and large gas range. For beach goers, supplies are provided; boogie boards, umbrella, a few wetsuits, beach chairs etc. For BBQs, sitting over the oceanfront while you grill your families dinner, it's wonderful!!! Master bathroom, dressing area before entry, and huge walk in closet. Separate Bathtub, shower with a safety hand bar. Bathroom 2, in 2nd king bedroom has a shower and bathroom 3 also has a shower, and is just outside of bedroom 3, around the corner out of view from the main hallway. Fully oceanfront as pictured, the beach access is only 3 doors up the street at Beacon's Beach. Very private yard. Glass wall surrounding the deck for viewing pleasure. Fully fenced property. National long distance phone calls included, by Magic Jack. 12 cup coffee maker and a large coffee grinder; in addition if you prefer a Keurig type, it is also supplied. Bring your coffee pods! Basic seasonings and much more. Sugar, and most spices are provided. An extra (4th) tv monitor screen in the 3rd bedroom for using with the dvd player. (3) Three Cable TVs are provided. Large HD flat panel in the living room has Netflix and each of the two king bedrooms have large flat panel TVs. Check the list for any movies, ask to purchase. Playing cards provided in wet-bar drawer, games under the entry cabinet. DTV also has Music Channels, look in the 800's. Beach toys in the garage, boogie boards, surfboard, wet suits, more. Lots of golf close by! Only 5 minutes drive to Encinitas Ranch Golf course, La Costa Resort and Spa, or Torrey Pines about 10 minutes south are a few examples. This is a single level house with few challenges to wheel chairs. There are no stairs, all single level, accessed from the garage, or the side walkway to the double front door. Master Bedroom has sliding glass doors off of the courtyard entrance, and sliding glass doors to the deck. 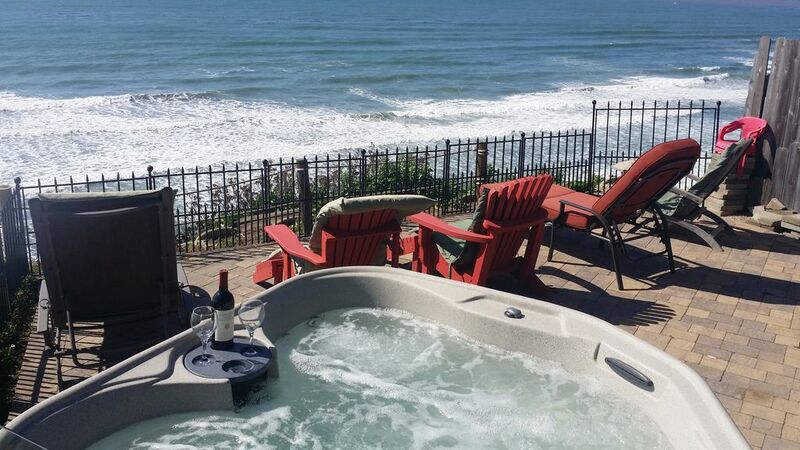 Oceanfront Jacuzzi hot tub overlooking the ocean waves and beach for the best relaxing experience! Copy-Scanner, Full Kitchen includes Microwave, Blender, Coffee makers, Coffee Grinder, Waffle Iron, all Cooking utensils and Circulon pots and pans provided, Boogie/body boards, beach chairs and umbrella, Smoking outdoors only. Spring water provided for you from the 60 gallon tank pumped to the kitchen, the refrigerator and master bathroom next to sink. Walk to restaurants and local coffee shops, Pizza, Mexican, Wine Bar. Grilles, local boutiques. We stayed for 5 weeks at 866 Neptune and we very much enjoyed our stay. All the comforts of home. A very well stocked kitchen with all the necessary cooking utensils. Lots of great books in the library, puzzles, DishTV. But the best part was the deck . . . spacious, lots of room and seating space, jacuzzi and very nice BBQ. And the deck was very private with walls on both sides. And the view was amazing, probably the best part. Chris and Eileen were very timely in getting back to us with any questions we had and were very accommodating. We are considering going back when we can. The location is unbeatable, especially if you're a surfer or enjoy watching dolphins, pelicans and surfers. It's on the bluff right above Beacons south reef, just a few steps to the path down to the beach. We've rented several houses on Neptune Ave, and this one is on the funkier side. But hey, it's Leucadia and that's part of the charm. This property was 3 houses away from the entrance to Beacons Beach in Encinitas, which my son the surfer says is the best place to surf in the area. The deck has outstanding views and we spent the majority of our time there. We saw dolphins every morning and Venus and Jupiter every night. The neighborhood is quiet. My 20 month old granddaughter had lots of room in the house to run around without fear of breaking anything as the home is very kid friendly. My 92 year old parents found the views inviting and the home safe as there are no stairs. Chris and Eileen are very friendly and prompt when we needed anything during our stay. We had a wonderful time and look forward to staying again next year. This house had it all. Beautiful ocean views from a perfect patio. Even had a hot tub. Lots of privacy and space for everyone. Encinitas is wonderful. We loved this trip and plan to do it again!